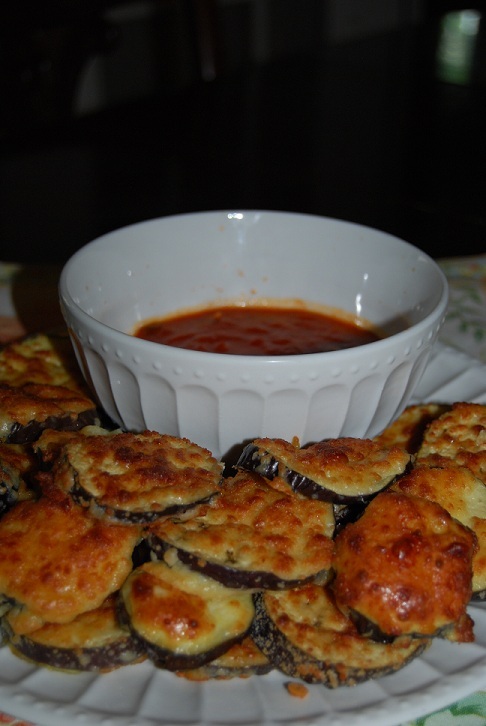 Try these Parmesean Eggplant Bites with your favorite sauce for an easy, delicious & healthy appetizer. Summertime in the South means it’s deck & pool time with friends. And when you have friends over, a fresh, easy, go-to appetizer recipe is key. The one that I’m sharing today is great because it’s delicious (even my son who typically turns up his nose at eggplant liked this), healthy, and uses a fresh summer veggie. Because the cheese used in this recipe is hard, parmesean cheese, it’s lower in fat content than a soft cheese, but once baked, it’s nice and soft and gooey with lots of flavor. Fresh Grated Parmesean Cheese – I like the refrigerated grated parm. Publix brand worked just fine. Place coated eggplant rounds on the cookie sheet. Once all eggplant is dipped and on the cookie sheet, place in a 400 degree oven for 10-15 minutes, until parmesean is bubbly and golden brown. Remove from oven, let cool for approx 5 minutes. While eggplant is cooling, pour sauce into a serving bowl, and warm in microwave. Stir sauce, and serve with eggplant bites. Thanks to my friend, Wendy, who shared this recipe with us!